Manny Stul, Moose Toys CEO and EY Entrepreneur of the Year 2015 with Moose Toys director Jacqui Tobias. EY Entrepreneur of the Year 2015, Moose Toys CEO Manny Stul with EY Oceania CEO Tony Johnson. 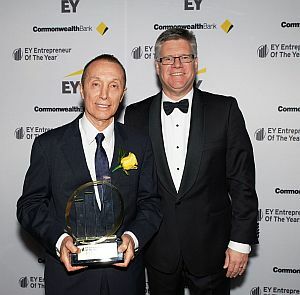 Moose Toys CEO Manny Stul has been has been named 2015 Australian EY Entrepreneur of the Year at an awards ceremony in Sydney. The award recognises his achievements as an Australian business leader here and abroad, and he will now go on to represent the nation at the world event in Monte Carlo next year. The judging criteria by which Stul was assessed included entrepreneurial spirit, innovation, personal integrity and influence, financial performance, strategic direction, and national and global impact. Stul says the award is recognition of the work put in by the whole Moose team, noting that he works with “incredibly passionate, talented, driven people, and they should all feel very proud of their contribution”. “I’m also delighted about the recognition this brings to Moose. It will help raise the profile of the company. While people within the toy industry and retail sector know what excellent work we’re doing, not many outside the toy industry , nor many everyday Australians realise that some of their favourite toys are designed and created right here, by a locally-owned and run company. “The key is our innovation, focus on ‘thinking outside the square’ and aiming for the highest standard and speed to market. Moving on from distributor models in the US and selling direct to the retailers has been a springboard for growth, seeing us firmly establish Moose as a force to be reckoned with in the world’s leading consumer market. “We are now a significant player on the global stage, an amazing achievement for an Australian-based company and something everyone can, and should, be proud of,” he said. Moose Toys is headquartered in Melbourne and develops, manufactures and distributes from its factories in China and Hong Kong to more than 82 countries. It is the fifth-largest toy business in Australia and fourth in the massive US market, up against global goliaths such as Hasbro, Mattel and Lego.